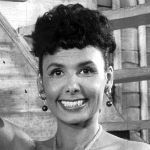 Lena Horne (June 30, 1917 – May 9, 2010) was an American jazz and pop music singer, dancer, actress, and civil rights activist. Horne’s career spanned over 70 years appearing in film, television, and theater. Horne joined the chorus of the Cotton Club at the age of 16 and became a nightclub performer before moving to Hollywood, where she had small parts in numerous movies, and more substantial parts in the 1943 films Cabin in the Sky and Stormy Weather. Because of the Red Scare and her political activism, Horne found herself blacklisted and unable to get work in Hollywood. Returning to her roots as a nightclub performer, Horne took part in the March on Washington in August 1963 and continued to work as a performer, both in nightclubs and on television while releasing well-received record albums. She announced her retirement in March 1980, but the next year starred in a one-woman show, Lena Horne: The Lady and Her Music, which ran for more than three hundred performances on Broadway. She then toured the country in the show, earning numerous awards and accolades. Horne continued recording and performing into the 1990s, disappearing from the public eye in 2000. Horne died of congestive heart failure on May 9, 2010, at the age of 92.